Best Walking Shoes for Women 2019 - Is It Different from Running Shoes? Walking is one of the most comfortable ways to exercise, and it is often underrated simply because it requires less effort to carry out. Just like other forms of exercise such as jogging and running, walking is equally important for your well-being. A lot of differences can be noticed between those who regularly walk to work and those who don’t do that. Even at our places of work, you will be surprised at how those who walk as part of their physical exercises are sharp and very productive. Besides, it helps strengthen your body muscles, improve blood circulation among other benefits as put forth by Dr. Mercola in his research. But all these are only possible if you do it the right way with the correct tools such as the best walking shoes for women; that is if you are a lady. If you have been using running shoes to walk for example, then you have been missing a lot. But wait, it is never too late to get it right. This guide has you covered. Read along and learn more. Are comfortable on the feet. Support the arches perfectly well. They’re long-lasting, therefore, minimizing frequent expenditure on shoes. Allow you walk for long distances in any kind of terrain without experiencing fatigued feet. For walking shoes, the height difference from the toe to the heel is always very low. This difference is what is known as heel drop and is usually measured in millimeters. Ideally, heel drops should be less than 8mm, but 4mm is often considered the best. The outer sole of the shoe should never be used to gauge the heel height as that is usually deceptive as the heel does lie deep in the shoe. On the other hand, runners’ feet strike the ground first at different parts depending on how one is running. These parts are the ball, heel or mid-foot. This is a totally different case from walkers who strike the ground with their heels instead. Running shoes are, therefore, designed with built-up heels for the purposes of stability. Walking shoes and running shoes alike should be flexible, but the point of flexibility depends on the purpose for which the shoes are meant for. Running shoes should be flexible at the mid-foot or arch while there are also others that flex at the forefoot. Walking shoes, on the other hand, do flex on the forefoot as the toes are where a lot of pushing occurs when walking. Shoes that bend at the arch are not good for walking. Should you come across shoes that aren’t flexible at all, then don’t even consider buying them. On weight, walking shoes are lightweight whereas the running ones are slightly heavier. To provide additional stability, running shoes are designed with flared heels especially for runners who use their mid-foot to strike the ground. On the other hand, walking shoes do not have flared heels. Walkers often use their heels to strike the ground meaning that flared shoe heels will cause some forward-rolling effect when making steps. Walking shoes should, therefore, have undercut heels instead of the flared ones. Walking shoes are quite similar to other types of shoes from the outward appearance. This can be quite confusing for first-time buyers. Even those who have been in the market before for the best walking shoes for women still find it difficult to narrow down to whatever they need. Good walking shoes should not be fitting too tightly that there is no space left for fresh air to get in. Consider walking for over 30 minutes and then try the shoes on. At this point, your feet will be a bit swollen as a result of walking. This helps you determine whether the shoes will be able to fit in your feet even after walking for long. The shoes should be well-sized such that even after walking for some time and your feet are swollen (of course it shouldn’t be severe swelling), they should still be perfectly fitting (not too tight and not loose as well). To allow for maximum breathability, there should be at least a space of 1.3 centimeters between the shoes’ tips and your toes. This is not too tight to bring you some pains neither is it too loose to make your feet fall off from them. Remember, your feet also need proper air circulation whenever you do the walk and this is only possible if the shoes aren’t too tight or loose. You need to consider this with a lot of keenness as you don’t want to get home with something that will make you uncomfortable. A comfortable walking shoe is all everybody needs; you included. On that note, walking shoes are often designed with some inside paddings that can make them comfortable as you do the walking. This padding is meant to cushion your feet from blisters, poking feet on rocky surfaces and bruises. Being that walking does involve a lot of effort, their level of cushioning especially in the heels is much lower compared with the running shoes. You shouldn’t, therefore, be surprised at the low level of cushioning of these shoes. They will definitely serve you right. The walking shoes of your choice need to be lightweight and flexible. An ideal walking shoe should weigh between 10 and 32 ounces. Why should you buy a heavier product that will tend to drag you behind actually? 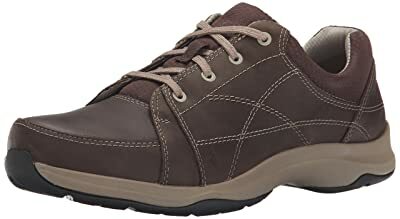 Lightweight walking shoes are often easier to walk around in regardless of the type of surface. The shoe also needs to be flexible. To check on this, twist the shoe at its sole and if it is able to twist to certain levels but not completely then it is the right one for you. A flexible walking shoe will make you experience the least resistance ever. When you walk, it is the heel that usually touches the ground first which calls for the use of flat heels. However, you don’t expect to get a completely flat athletic shoe. The difference in measurement of the heel drop should be approximately 10 to 30 millimetres depending on the shoe design. Having heels higher than the toes creates a lot of pressure on the toes resulting in blisters. The choice is basically yours to make depending on your level of comfort with the shoes on. For your body weight to be distributed effectively, the feet always tend to form 2 types of arches. These are longitudinal and side-ways arches. Now, longitudinal arches cover the areas spanning to the heel top from the insole’s bottom part whereas side-ways arches cover insole’s one corner to the next. In your search for the ideal walking shoes for women, you need to have prior knowledge of what your type is. How is this done? Well, you only need to examine your footprints to ascertain the kind of arch type you have. If you can see your entire foot in the print, then you have a low arch, and if you can sparingly see your foot’s middle part, then yours is a high arch. There is also a neutral arch type if you can’t witness any of the above types of footprints. For the low arches, the shoes need to have slightly lesser heel drop with little flexibility to ensure the feet remain stable. For high arch types, which usually lack natural shock control, you need to go for walking shoes that have extra padding as well as some curvature when it comes to their design. Neutral arch types do not demand a lot, but you still need to choose whatever will fit and work for you. You don’t actually need to spend a lot to get ideal walking shoes. As long as the pair of shoes have almost all the features we’ve seen above, don’t mind spending about $60 plus or even below if you so find such in the market. You definitely need to work within your budget as it is the pocket that does the talking when it comes to issues to do with money. 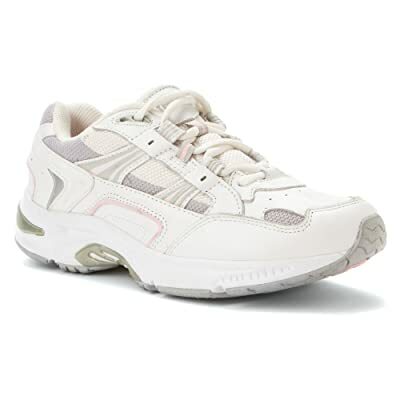 This is a nicely-looking walking shoe for women that are known for great performance. It is comfortable due to the well cushioning. The product provides maximum support for walkers with neutral arch type. Besides, it boasts of high flexibility provided for by its outsole made of rubber which makes it durable and the best when it comes to traction. This plush shoe makes you forget everything about pronation as long as you make them part of your walking adventure. The fact that these shoes are made using full grain leather makes them long lasting and durable. They are also light and easy to walk in. Another good thing you will love about these shoes is that they come in different colors so that you can choose the color that pleases you. If there is any reason at all that can stop you from buying the editor’s pick above, then this is another great product you can consider whenever you are in the market for a new pair of walking shoes. It is relatively lightweight and considerably flexible which are ideal for any walking shoe. This pair of walking shoes for women is comfortable to walk in and is also good looking. Women like beautiful things and the manufacturers factored in that reality when creating these shoes. The insoles of these shoes are high rebound and the cushioning is 5Gen. All these make these shoes ideal for all your walking needs. What’s more, they are also very flexible and will provide the much needed support for your arch. Are you worried about experiencing any difficulties in wearing or removing these shoes? Worry no more as these shoes are very easy to wear and remove. 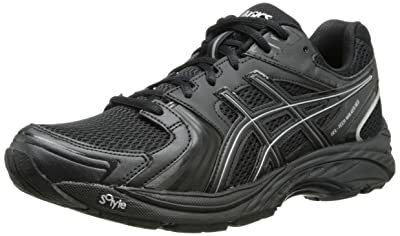 The GEL-Tech Neo 4 from ASICS provides the much needed upper fit on your feet. It also boasts of perfect breathability besides its anti-microbial and internal comfort from the ortholite sock liner. This particular company has been on the market for quite a long time and can, therefore, be trusted for their continuous production of high-quality walking shoes like this over here. Its soles are well designed to bring the stability and support you deserve when making the steps. Even if you decide to walk for longer distances, your legs and knees won’t get fatigued. At no point will you have bruises and blisters on your toes. YIDI women’s walking shoes are fashion sneakers that are comfortable on the feet when worn. The comfort can be majorly attributed to the high breathability property that they have. Additionally, putting them on and off isn’t a difficult task. These shoes are brand new, made of advanced materials, lightweight and simple in appearance. They are also great products that you can buy as well. The design is a healthy one which is coupled with the environmental-friendly material in the construction of the shoes. They provide your arches with the necessary amount of support that they need. They also have the abilities to tighten and loosen them depending on your feet’s natural motion. 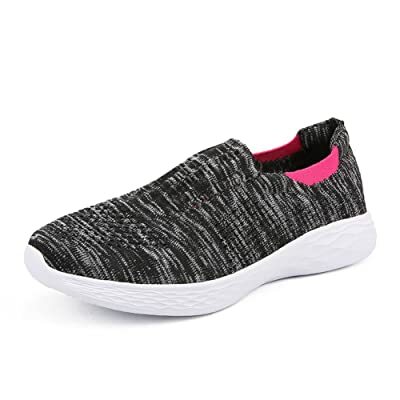 This is a low-profile women’s walking shoe that you can buy as well for your own use or even as a gift to your friend or family member. Its upper mesh is designed purely to match the needs of ladies with the cat branding over the toe making it stand out whenever you have it on. It has a very sporty look as a result of the midsole which has been dynamically curved lowly towards the ground. Even by giving it an outward look, you will realize that this product is purely designed for walking experiences. To help keep your feet fresh regardless of the duration of your walking, this shoe brand has been made with soft foam inserts to make your feet comfortable. It weighs approximately 5 ounces which is lightweight and won’t, therefore, strain your feet. These shoes from Orthaheel are other great ones specifically designed to be use by ladies when walking. These shoes are made of leather on the upper part which makes them water resistant. Besides being sporty, they are made of anti-bacterial treatment to keep your feet safe and comfortable at any given time. The shoes are designed in a manner to realign the strides you make as a result of the heel cup contoured arch support brought about by their motion-controlling footbed. What’s more, these shoes weigh only around 2 pounds which makes them easy to walk around in. The midsole of these shoes are also made of shock-absorbing EVA that will make sure that you don’t experience any shocks. 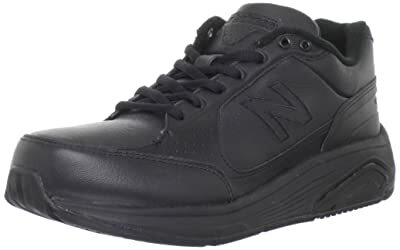 The WW928 walking shoes for women from New Balance should also feature in your list whenever you are looking for shoes under this category. The shoes are made with rubber contents to increase cushioning and comfort by extension. At the same time, the rubber ensures that there is an increased compression resistance which is good in absorbing forceful impacts that might result in injuries. Enjoy a nice, long and lovely stroll with this pair of walking shoes. Get yourself a well-fitting pair of shoes and feel the difference as you walk. Regardless of the type of arch, these shoes will provide your arches with support to the maximum. What’s more, they only weigh 14.4 ounces which makes then ideal to be used for walking by women. 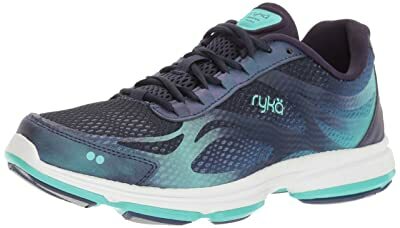 Ryka Women’s Devo Plus walking shoe has feminine and flowing seamless overlays that make it really stand out and, therefore, feature among the best products to look out for. 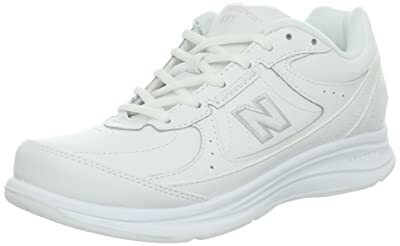 It is breathable and provides the comfort that every walker yearns for in a shoe. Every step you make with these shoes, rest assured of maximum support from the product. It doesn’t cost much; therefore, you can give it a try as well. It is also very easy to wear and remove after a walking adventure. It is nicely designed which brings out the superb visual interest as a result of the 4-way gradient print made on the mesh. With a total weight of only 8.3 ounces, you can be sure that these shows won’t be so heavy on your feet as you walk around. 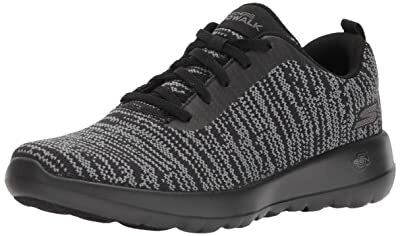 Ahnu Taraval shoe is lightweight and an attractive lace-up that combines technology and comfort to bring the best out of the walking experience whether along the combed trails or urban streets. It is water-resistant which makes it capable of protecting your feet against harmful elements that might be found in the groundwater.This pair of shoes also has a breathable mesh that ensures that sweat and any moisture are wicked away from the shoes. Rest assured of proper cushioning and all-day support of your feet whenever you have them on. The other good thing about this pair of shoes is that it is waterproof and has a rubber sole. This makes it ideal for walking even in watery or slippery areas. Besides them being designed for walking, the pair of shoes keeps you comfortable as well. The supple leather that has been used on the upper side is durable and breathable. It also comes with adjustable straps to ensure that it fits well. These shoes are available in different sizes for almost every buyer. Just make an order and have them delivered to your address within a short time. They are durable and will give you value for your money without any doubt. Another good thing you will about these shoes is the fact that they are lightweight and are, therefore, ideal for women. It is time we recognized walking as an important form of exercise. Having done the acknowledgment, what should follow is the use of right gear for the exercise. However, don’t expect to enjoy the fruits of walking immediately; it takes time. Among the many benefits of walking is weight maintenance, something that many ladies are currently struggling with. 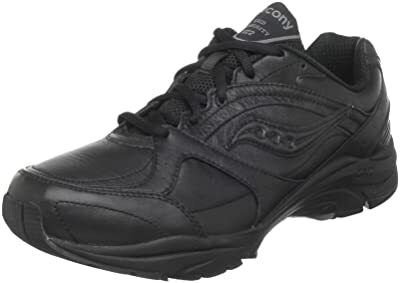 As a woman who wants to shed some pounds off without a lot of struggle, just get yourself a pair of Saucony Women’s ProGrid ST2 Walking Shoe as they are the best walking shoes for women. These shoes are comfortable due to incredible cushioning that they have been designed with. Their flexible soles are made of durable rubber besides being well-priced. They are also lightweight and breathable; features which an ideal walking shoe needs to have. These are just among some of the reasons as to why it is the best of them all.